A stored-value card refers to monetary value on a card not in an externally recorded account and differs from prepaid cards where money is on deposit with the issuer similar to a debit card. One major difference between stored value cards and prepaid debit cards is that prepaid debit cards are usually issued in the name of individual account holders, while stored value cards are usually anonymous. The term stored-value card means the funds and or data are physically stored on the card. With prepaid cards the data is maintained on computers affiliated with the card issuer. The value associated with the card can be accessed using a magnetic stripe embedded in the card, on which the card number is encoded; using radio-frequency identification (RFID); or by entering a code number, printed on the card, into a telephone or other numeric keypad. 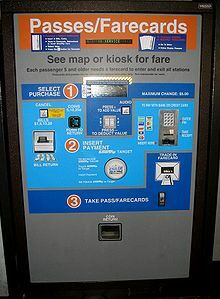 Typical applications of stored-value cards include transit system farecards, telephone prepaid calling cards or for micropayments in shops or vending machines. Examples of country specific payment cards include Chipknip in the Netherlands, Geldkarte in Germany, Mon€o in France, Proton in Belgium, FeliCa in Japan, EZ-Link and NETS in Singapore and Octopus card in Hong Kong. The German Geldkarte is also used to validate customer age at vending machines for cigarettes. Typical applications of organisation specific or industry specific prepaid card include payroll cards, rebate cards, gift cards, and travel cards and U.S. based health schemes such as HSA cards. The U.S. Department of the Treasury manages three stored-value card programs (EZpay, EagleCash, and Navy Cash) which are used by the U.S. military as electronic alternatives to cash in areas characterized by difficult access and limited banking / telecommunications infrastructure. A vending machine sells farecards for the Washington Metro subway. Closed system prepaid cards have emerged and replaced the traditional gift certificate and are commonly known as merchant gift cards. "Closed system" means the cards are only accepted at a single merchant. Purchasers buy a card for a fixed amount and can only use the card at the merchant that issues the card. Generally, few if any laws govern these types of cards. Card issuers or sellers are not required to obtain a license. Closed system prepaid cards are not subject to the USA PATRIOT Act, as they generally cannot identify a customer. As debts owed to consumers who purchased the card, these purchases remain on the books of a merchant as a liability rather than an asset. Consequently, gift certificates and merchant gift cards have fallen under state escheat or abandoned property laws (APL). However, the emergence of closed system prepaid cards has blurred the applicability of APL. North Carolina and Illinois have excluded these types of cards from APL provided the card has no expiration date or a service fee. Maine and Virginia require the issuer to pay the state when the cards are abandoned. In Connecticut an issuer is required to identify the residence of the gift card owner. Since most merchant gift cards are anonymous, the residence of the card's owner is deemed to be the state's treasurer's office. Presently, no law exists that requires an issuer to provide refunds for lost or stolen cards. Whether a refund is possible is specified in an issuer's cardholder agreement. In addition, most closed system cards cannot be redeemed for cash. When a cardholder redeems all but an insignificant portion of the card on merchandise, that amount is generally lost and is absorbed by the issuer. Such cards are increasingly becoming a way for Mexican drug cartels to smuggle money across the border without repercussions. Semi-closed system prepaid cards are similar to closed system prepaid cards. However, cardholders are permitted to redeem the cards at multiple merchants within a geographic area. These types of cards are issued by a third party, rather than the retailer who accepts the card. Examples include university cards and mall gift cards. The laws governing these types of cards are unsettled. Depending on the state, the issuer may or may not be required to have a money transmitter license or other similar license. In addition to the District of Columbia, the states that require a license include Connecticut, Florida, Illinois, Iowa, Louisiana, Maryland, Minnesota, Mississippi, North Carolina, Oregon, Texas, Vermont, Virginia, West Virginia, Washington, and Wyoming. Note, these states explicitly require licensing for card issuers. Other states may have more subtle licensing laws. Under 18 USC section 1960, it is a crime for an issuer to conduct a money transmitting business without a license. Cardholders generally suffer from the same redressability problems that closed system card holders suffer. It is unclear whether or not Chapters 7 and 11 of the Bankruptcy code are applicable to these types of cards. Open System Prepaid Cards or network branded prepaid cards are not credit cards, although they are sometimes marketed as "prepaid credit cards". No credit is offered by the card issuer and the cardholder spends money which has been prepaid to a card. Therefore, these cards are also marketed as "prepaid debit cards". The value is not physically stored on the card instead, the card number uniquely identifies a record in a central database, where the balance is recorded. These cards are similar to closed system prepaid cards, but are endorsed by a retail electronic payments network such as Visa, Visa Electron, MasterCard, or Maestro and can, unlike gift cards, be used anywhere debit cards with the same logo may be used. They are very similar to a debit card except that they don't require a checking account. They have been heavily marketed in the United States as a safe and responsible means for parents to give their children some spending power which is why they sometimes are referred to as teen cards. Whilst in the United Kingdom, they have been heavily marketed as a convenience tool and budgeting aid for global usage. Market participants such as Kalixa, Caxton FX, Travelex and My Travel have used these cards to stimulate the adoption and appeal of open system prepaid cards in the UK. These cards have seen a 10 – 15% growth since they appeared in the UK market in 2005. These cards are also sometimes referred to as "open loop" cards. These cards have been marketed to consumers with poor credit, who are unable to qualify for the line of credit that backs a mainstream credit card. The fees associated with these cards are often very high. These have been criticized as unjustified, because the issuer is not taking any credit risk. The Financial Consumer Agency of Canada describes prepaid credit cards as "an expensive way to spend your own money"
A variation on this are the PaidByCash virtual cards in the United States and the 3V cards issued in the Republic of Ireland. These consist only of a card number plus expiry date and verification number, so can only be used for customer not present transactions. The Tobacco Card has undergone testing and is scheduled for nationwide introduction in Japan in 2008. It will contain an IC with information about the cardholder's age, and will be required for purchasing cigarettes from vending machines. It will have stored-value capability. Generally these cards are afforded similar characteristics as "open system prepaid cards". Similar to credit cards, these cards may carry an expiration date, an account number, and a verification number. They also may carry with them service fees and other fees associated with use, or non use of the card. The money on the card can be redeemed for goods only, and is not redeemable for cash. These cards are generally issued by a "money services business"(MSB) or an FDIC banking institution. The type of issuer depends on the law governing them. MSB's are only required to obtain a money transmitter license if they sell more than $1,000 per person per day. Cards issued by an MSB generally are governed by the laws governing "closed system cards" and "semi-closed system laws". Cards issued by an FDIC bank are covered under the Federal Reserve Act and afford cardholders much more protection and opportunity to assert claims. The cardholder should be aware of the network's agreement and rules and regulations set forth by these networks. Another example of open system prepaid cards is the Payroll card. Payroll cards are used by employers to pay employees. The employee is issued a card that permits access to an account established by the employer. At the end of each pay period, the employee's ability to draw money from that account is increased by the amount of his or her wages. The card may be used at an Automated Teller Machine (ATM) to obtain cash, and may be used at a store to pay for purchases. The payroll card is particularly useful for employees who do not have a regular checking or savings account at a financial institution because they can access their wages conveniently. Also, if there is no charge for using an ATM, they avoid fees charged for cashing checks. The advantage to the employer is low cost of paying wages and efficiency. These cards are subject to Chapters 7 and 11 of the Bankruptcy Code, as well as the Electronic Funds Transfer Act (Regulation E). They are also subject to the Federal Deposit Insurance Reform Act. There is growing concern that drug traffickers and other criminals worldwide are using stored-value cards to move the proceeds from drug transactions and other criminal activities across international borders. In the United States, it is legal for anyone to enter or leave the country with money that is stored on these cards, and (unlike cash in high amounts) does not have to be reported to customs or another government entity. Some members of the U.S. Congress are considering creating laws that would require travelers crossing entering or leaving the country to report these cards. The Financial Crimes Enforcement Network of the U.S. Department of the Treasury, has published a notice of proposed rulemaking on stored-value cards in the June 28, 2010 edition of the Federal Register. The proposed rules would require sellers of prepaid cards to register with the government and keep records on transactions and customers. ^ Dlabay, Les R.; Burrow, James L.; Brad, Brad (2009). Intro to Business. Mason, Ohio: South-Western Cengage Learning. p. 433. ISBN 9780538445610. ^ "Assessment: Prepaid Stored Value Cards". Johnstown, PA: National Drug Intelligence Center. October 31, 2006. http://www.justice.gov/ndic/pubs11/20777/index.htm. Retrieved December 16, 2009. ^ "About Cash passport prepaid currency". Travelex. http://www.cashpassport.com/1/en/uk/About-Cash-Passport/. Retrieved August 6, 2011. ^ "Roundtable Concludes The UK Prepaid Market Is Alive And Very Much Kicking". SCL. November 25, 2009. http://www.scluk.com/roundtable-concludes-the-uk-prepaid-market-is-alive-and-very-much-kicking-1. ^ "FCAC Launches pre-paid payment card guide". Financial Consumer Agency of Canada. October 19, 2006. http://www.fcac-acfc.gc.ca/eng/media/pressRelease/index-eng.asp?postingId=225. Hughes, Sarah Jane, Stephen T. Middlebrook, and Broox W. Peterson. "Developments In The Law Concerning Stored Value and Other Prepaid Payment Products". Business Lawyer, November 2006. This page was last modified on 19 August 2011 at 17:53.